Mod The Sims - Rugs - zMOG!! Off Grid!! Fixed Instance numbers for the resources so they no longer override original CEP resources added in the CEP by Numenor. Place all EA rugs on a diagonal or off grid! 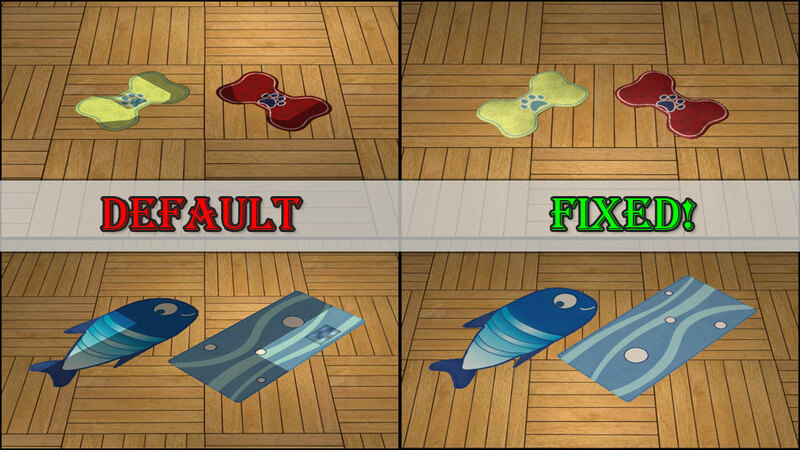 So rugs in TS2 sink into the ground when placed, basically leaving them very flat. Most of the actual meshes however are not flat! They sit up off the floor with a nice shape. Especially the stones from Family Fun Stuff (shown below) which are quite useless when flattened! 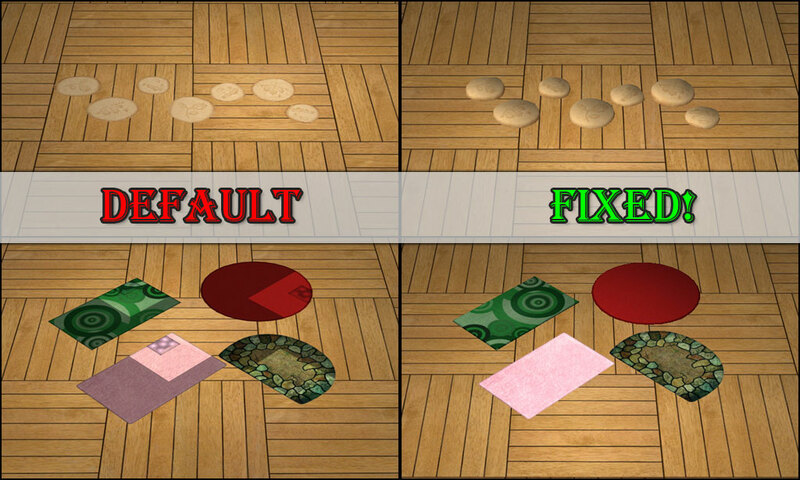 This mod will make each rug from all EPs and SPs be able to be placed off grid using snapobjectstogrid false, the M&G quartertile placement cheat, or on a diagonal. Rugs will now not sink into the floor when placed. They also will not have odd lighting when placed off grid. There are so many rugs in game so I didn't take a picture of each one, just a select few from different EP/SP. 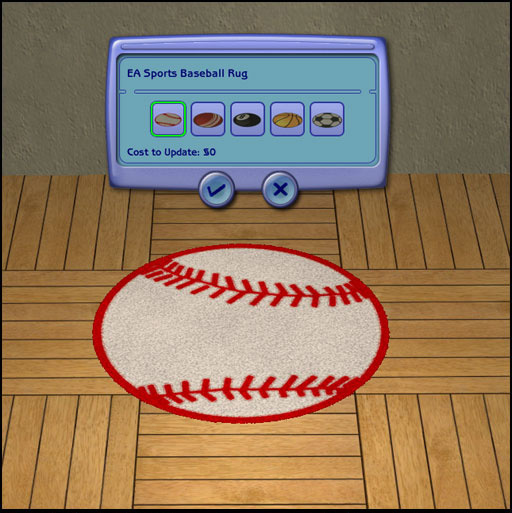 I have also taken the FT rug and combined all the sports related ones into the EA Sports Baseball Rug and hiding the other four sports related ones. I figured I might as well do this since this mod will interfere with that hider mod one anyway. This will conflict with any type of recategorizing or hider mods for rugs, specifially this one by Gwenke33 . This will not directly conflict with the M&G fix by Goggalor at MATY, but you no longer need that fix. For any rug recolors from NL, OFB, and maybe SSN, the recolors will be very dark. Those need to be fixed. Any future recolors after placing this mod should be fine. How to fix existing recolors. This method can also be used to fix store rugs, which I will not be sharing. Installation for this mod is a little different. There are two types of files, one has xxBin.package and one has xxDL.package. The bin one needs to be in the latest EP bin folder to keep the rugs from having the * star. The DL one needs to be loaded after the CEP since it has TXMT resources in it. There are two packages - Please don't download both!! I have uploaded one file for those with ALL EP/SPs, and one for those missing one or more EP/SPs. Do NOT include with lots! *Someone named Lash who's file was missing the BHAVs so that I knew the solution was not there. *Echo for her rug clone which I have been poring over forever. *Goggalor at MATY for searching the dusty recesses of the brain trying to remember what was changed in the M&G rug fix. Which I was trying to reverse engineer. This mod has two parts. Place in your C:\Program Files (x86)\EA GAMES\LatestEP\TSData\Res\Catalog\Bins folder.